This Materia Medica Omeopatica Clinica is the fruit of many years of experience, total dedication, study, careful observation and constant meditation on many problems that arise in Homoeopathy. The author, even though he was a dermatologist, did not stop at “external” diseases, but realised that “the skin is the mirror of the soul” and that suppressing cutaneous manifestations of internal origin “the soul becomes ill”, as Hahnemann observed. Since then he has never stopped looking for a reference point to understand the true Unicist Homoeopathy and to have the technical tools to put it into practice. The basic tool is learning the method, and the method is explained and commented on here. This work is the fruit of many years of homoeopathic practice and contains much precious advice and the results of a large number of observations. - The application of the fundamental principles in spontaneously complicated cases - in cases made complex by the incorrect application of Homoeopathy and those made complex by Allopathy. - The compatibility between Homoeopathic and Allopathic treatment. - The behaviour of children in the surgery. - Fundamental principles of treatment in idiosyncratic subjects. - Collagenopathies and dermatoses in depressive syndromes. This volume can certainly be helpful both for those doctors who are approaching Homoeopathy for the first time and also as a means for concrete comparison for those homoeopaths who have been carrying out this profession for some time and have the aim of enriching their understanding, the end being to improve the health of human beings. Dr. Ioannis Konstantos, a unicist homoeopathic doctor, is the director of the “Pieria” International Academy of Classical Homoeopathy in Pisa (Italy). He was born in Ritini-Katerini (Pieria, Greece) on 25 March 1949 into a farming family. He lives in Pisa, is married and has a son and daughter. After his high-school studies in Greece he moved to Italy to attend the University of Pisa in the Faculty of Medicine and Surgery, where he graduated and then specialised in Dermatology and Venereology. He has dedicated his professional life to Unicist Homoeopathic Medicine, following the concepts and principles of C.F. Samuel Hahnemann, the father of Homoeopathy. He further specialised in International Institutions and has continued to keep in contact with European homoeopaths to cultivate a continual exchange of information. Clinical experience has allowed him to enrich the Materia Medica by experimenting with “remedies” which have not been very well-known up to now. As a teacher for some years in national training courses for homoeopathic doctors he makes use predominantly of video recordings in the classroom. His aim is to disseminate Classical Homoeopathy through direct testimony which shows in a simple and practical fashion his patients' recovery from acute and chronic diseases. It was with great pleasure that I accepted this work by Dr. Ioannis Konstantos whom I met through our mutual friend Dr. Stefano Benvenuti. I am convinced that we Italian homoeopaths should believe more in our ability to publish and not allow ourselves to be surpassed by our foreign colleagues, who publish their experiences and ideas more easily. I believe that principals and teachers in the numerous, competent Schools of Homoeopathy in Italy should undertake to publish a textbook or lesson notes or some original work, in the same way that Ioannis has done, which can contribute to the growth of the study, knowledge and spread of our dear Homoeopathy. There are plenty of ideas, all that is needed is the requisite desire to put them into practice, together with the right dose of the spirit of sacrifice, but I do not believe the latter is lacking in any homoeopath since by now we are well used to going against the tide, and have done so for some while. In fact, simply because of the innumerable applications of the Law of Similitudes, of the multiplicity of ways through which you can approach a patient and yet more because of the almost infinite and ever-new characteristics of each human, be it a therapist who through his or her individual bio-pathographic story comes into contact with a patient, or the patient himself with his just-as-singular personality, I am sure that each homoeopath has something to communicate and, therefore, teach us all. Paraphrasing a well-known saying, I would say “there is no homoeopath so rich as to have no need of others' advice, but neither is there a homoeopath so poor who has nothing to teach his colleagues”. I welcome this occasion to remind you that, despite its limited capabilities, Salus Infirmorum snc, is at the disposal of whomsoever should wish to follow the path laid out by Dr. Ioannis Konstantos and a few others who, apart from cultivating their “garden” in the best possible way, try to make their ideas public for the benefit of the Homoeopathic Community. To these Italian Authors and all those who shall imitate them I give my heartfelt thanks and also those of their present and future Readers. Summing them up, Cicero's words mean: skin is the mirror of the soul. This Materia Medica Clinica derives from many years of experience, of real dedication, study, careful observation and constant meditation on many problems that Homoeopathy presents. Many years ago I attended my first course in Homoeopathy, which lasted a week. I remember that during a break between lessons I asked the teacher for some clarification regarding a remedy, precisely about Gelsemium sempervirens. He replied like this: “Dear colleague, you have to study because you're still not an expert on this remedy”. Two years later, during a seminar held by the same teacher I asked for clarification about differential diagnosis among the remedies for anxiety about one's health. He answered in the same way. “You have to study”. Disillusioned, I left the conference room thinking that this sort of Homoeopathy was not my cup of tea. Perhaps that teacher was right to advise me to apply myself more to studying Homoeopathy, but I realised there were some deficiencies in the theory and application of the homoeopathic method: a lot of matters remained confused. Since then I have always looked for a reference point to understand the correct Homoeopathy and to have the technical instruments to put it into practice. The basic instrument is learning the METHOD. It is only in this way that you can learn the line of therapeutic conduct to follow, both for individuals in a good state of health and those with chronic diseases and bad health. I was lucky enough to follow the lessons of that master, George Vithoulkas, who put at our disposal his vast knowledge and experience, allowing us to understand and apply practical clinical criteria. One I had learnt the method, I continued to work hard, observing and studying day after day, thinking about the failures and anyway patiently collecting all the cases. This Materia Medica Clinica is based on information arising from my clinical cases which I have collected over these long years of work. It is an honour for me to present it to my Colleagues and to the doctors who sympathise with our doctrine, but who maybe still have some perplexities and curiosity about it. This work contains 65 clinical cases of acute and chronic diseases of a certain gravity, of which 40 have been videotaped with direct testimony on the part of my patients. Several of these recoveries have been confirmed by investigations with instruments that any doctor can have at their disposal nowadays. - The application of the fundamental principles in spontaneously complicated cases, in those complicated by an incorrect application of homoeopathy and those complicated by Allopathy. - The compatibility of treatment between Homoeopathy and Allopathy. - The behaviour of children in the surgery: how they move, gesticulate and the language they use. - The fundamental principles of therapeutic conduct in idiosyncratic individuals. - Collagenopathies and dermatoses in depressive syndromes: this is a topic I consider extremely important since we are dealing with pathologies where errors are committed by homoeopaths more frequently, with uncritical prescriptions for remedies and often unpleasant results for patients. 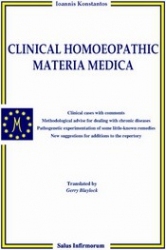 It is necessary to add that the symptoms contained in these Materia Medica notes are experimental in part, but mainly they are clinical, in other words, present in the patients and treated by remedies. As regards clinical symptoms, I have to point out that I assigned them to the remedy only when they were present in at least three patients treated with the same remedy. I do not claim that this Materia Medica I offer to my colleagues is free from imperfections. I hope they shall pardon them, considering that the intention which inspired this work was to share my personal clinical experience with those who, like me, believe in Homoeopathic Medicine and its potential for a global or holistic cure of the individual. I hope this book may be useful both for those doctors who are approaching Homoeopathy for the first time and also as a means for concrete comparison for those homoeopaths who have been carrying out this profession for some time and have the aim of enriching their understanding, the end being to improve the health of human beings. Drugs, highs, illness: whose fault? Can the Platinum metallicum subject become a normal person again after homoeopathic treatment?